ON THE ROOF OF THE WESTERN WORLD. 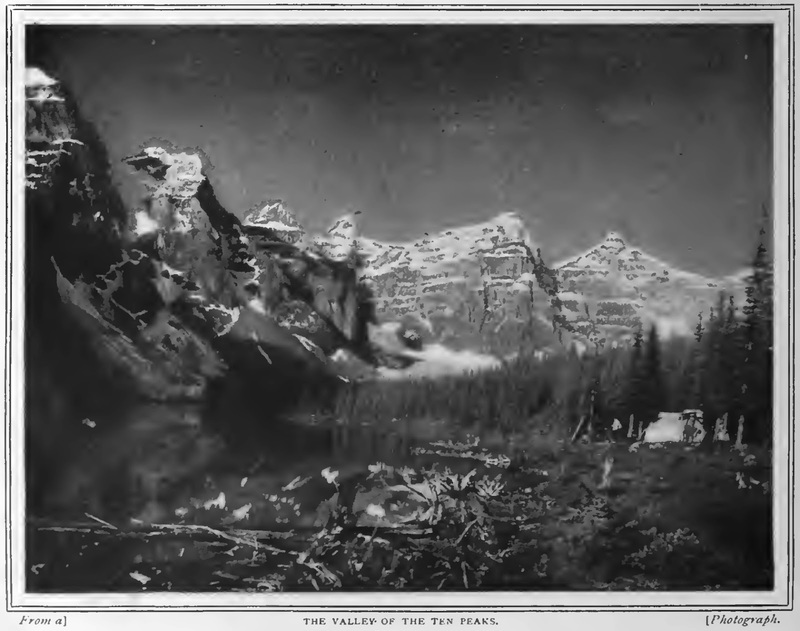 Mrs. Henshaw is a well known mountaineer, and in this article she describes the first ascent of one of the mighty peaks in that paradise of the climber, British Columbia, where hundreds of summits remain untrodden by human foot. Mrs. Henshaw illustrates her narrative with some impressive photographs. THE Rocky and Selkirk Ranges, which separate British Columbia from the rest of Canada, form without doubt the finest untrodden field for the Alpinist in the Western world. I say untrodden advisedly, for in spite of the records achieved by such eminent men as Mr. Edward Whymper, Dr. J. Norman Collie, Mr. James Outram, and other intrepid Britishers, only the merest fringe of these glorious ranges of mountains has as yet been explored. Every climber knows the pride of a “first ascent,” and in Western Canada there are hundreds of unconquered peaks, each awaiting its Napoleon of the ice-axe to build the “stone man” on its summit. Just north of fifty-two degrees north latitude, at an elevation of ten thousand feet, lies the vast Columbia ice-field, two hundred square miles in extent, forming the central source of many important rivers, and probably the largest glacier in the world outside of the Arctic Circle. This particular ice-field heads the long list of those which lie within the boundaries of British Columbia, for even the most cursory survey of the region forces upon the attention of the traveller the fact that a wonderful wealth of névés and glaciers gleams and glitters like a priceless parure of diamonds upon the mighty breast of the Western hills. The variation in the scenic setting of the mountain pictures is extremely fascinating. The strong contrasts which exist between the warm, flower-strewn valleys; the deep green, conifered slopes, cleft by many a vagabond rill; and the terrific cliff's and snowy crests, bring with them a new surprise at every turn; while the beauties of snow-crest, wood, and water entrance the sight and inspire the mind with high and happy thoughts. Whether you are an expert climber or only an ardent lover of the out-of-doors, the joy of a summer holiday spent among the Canadian Rockies brings an equal appeal. There are several excellent climbing centres in the Rocky and Selkirk mountains, where chalet hotels form the basis of operations and offer comfortable accommodation to travellers, and where climbing and camping outfits and the services of expert Swiss guides are obtainable. Each locality offers special attractions of its own. At Glacier, in the Selkirks, Sir Donald (10,645ft. ), named after Lord Strathcona, formerly Sir Donald Smith, and now High Commissioner for Canada in London, is a capital climb, offering a variety of experiences on rock-work, glacier, snow-slope, arête, and couloir; while near by Mount Bonney (10,625ft. ), Mount Fox (10,000ft. 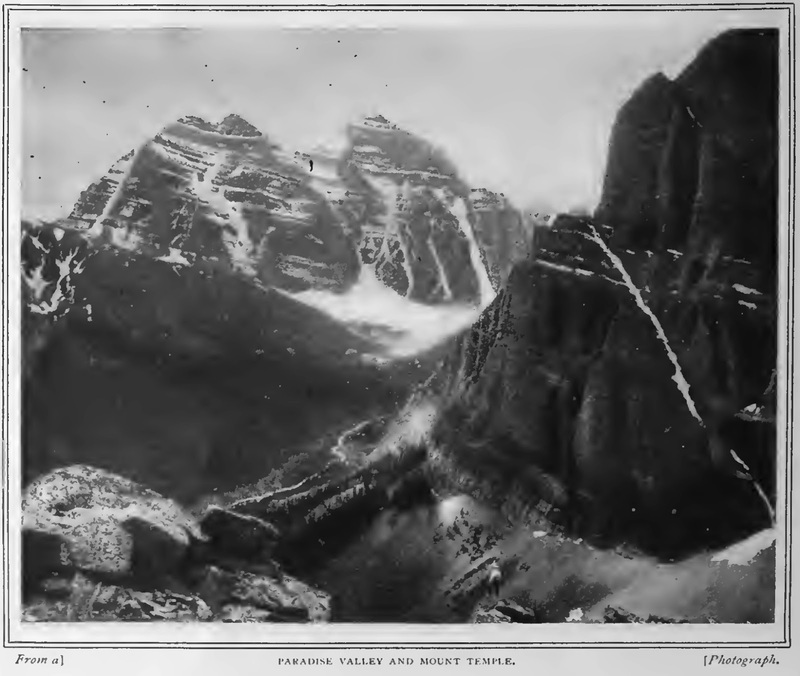 ), Mount Purity (10,100ft. ), Mount Dawson (10,800ft. ), and The Hermit (9,222ft.) are all delightful ascents in which more or less difficulties are encountered, and from which all danger is eliminated under the splendid guidance of the Swiss. As its name denotes, there are many ice-fields in the vicinity of Glacier, the chief ones among them being the Great Glacier and the Asulkan, and from the summit of Mount Sir Donald alone one hundred and twenty-five ice-fields are visible. At Kield, in the Rockies, the choice of ascents is unlimited—Mount Stephen (10,428ft. ), The Chancellor (10,400ft. ), Mount Vaux (10,600ft. ), Goodsir (11,400ft), Cathedral Mountain (10,100ft. ), Mount Collie (10,500ft. ), and Mount Assiniboine (11,860ft.) all being fine climbs, while dozens of other first-rate peaks which have been climbed, and hundreds of peaks which have not been climbed, rise up on every side. But it is the Lake Louise district in particular that I set out to describe in this article. 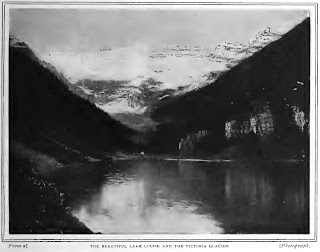 The turquoise lake, whose waters are like fluid light, lies cradled in the arms of magnificent mountains; at one end stands the chalet, a fleck of human civilization amid a world of Nature in her most majestic mood; at the other rises Mount Victoria, on whose ledges rests a glacier green and grim, cloaked by a glittering névé. 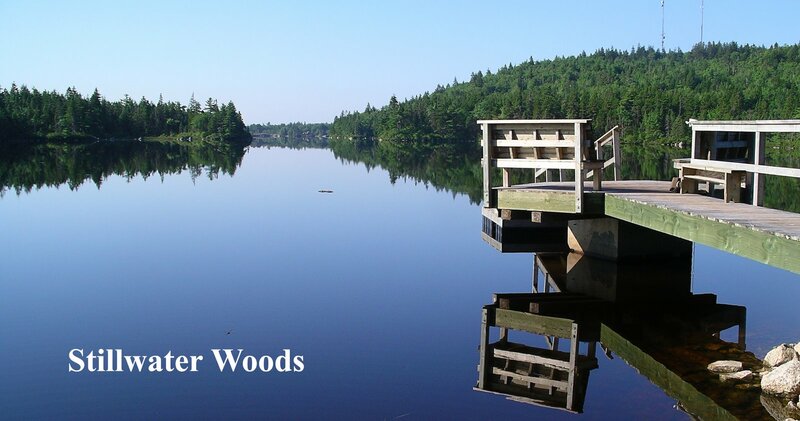 At either side stand ranks of fir trees, and about the shore the shrubs of the Labrador tea and white rhododendron shelter masses of blue-eyed veronicas, saxifrages, and purple garlics. Lake Louise is a spot of matchless beauty, one of those perfect pictures painted by Nature upon the canvas of the world, in colours borrowed from the rainbow. Artists and poets have sung its praises, men have marvelled and admired, but no one has ever wearied of the peace and perfection of the scene. It is to this place that many people journey in the golden days of summer, to climb thence the glorious peaks whose ice-architraves and snow-domes, guarded by frozen gates, form temples fit for the gods. Only those who have stood on the topmost pinnacle of a hitherto unclimbed crest can fully realize the feeling of exultation and pride which fills the breast of the enthusiast who achieves a “first ascent.” This is the reason why the Rocky Mountains form such a favourite playground for Alpinists. Switzerland has been so thoroughly exploited that there is little or nothing left in that land to tempt adventurous spirits in search of fresh fields to conquer. But in British Columbia mountain after mountain rears its untrodden heights to heaven, and offers to the traveller the lure of the most magnificent scenery in the world. Having spent a few days at the Lake Louise Chalet, and got into good training by means of long scrambles up Mount St. Piran, the Beehive, and the stiff crags of Mount Aberdeen, our party set out early one morning, accompanied by two Swiss guides, bound on a mountain-climbing expedition. 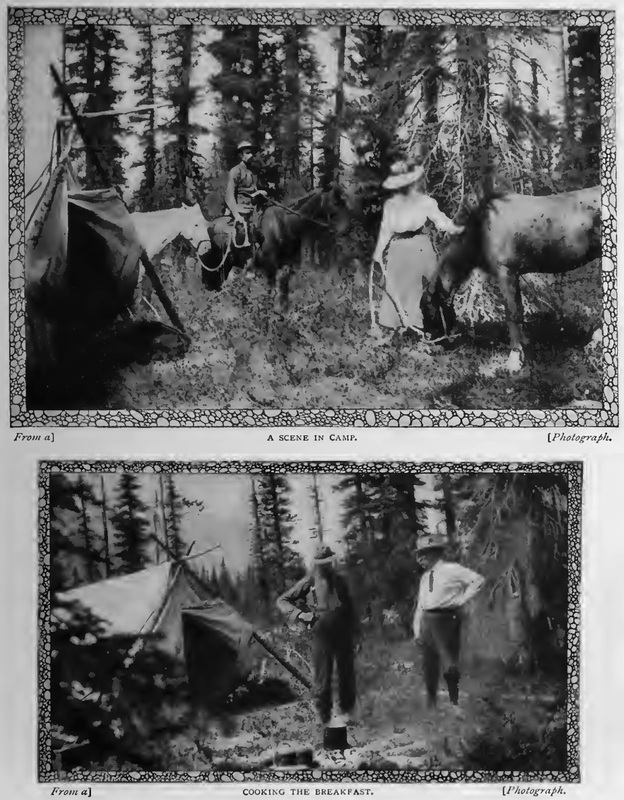 It was our intention to ride as far as was feasible along the mountain trail, and to camp for the night on the shore of a small lake some fifteen miles distant, so as to make the desired ascent thence with comparative ease on the following day. The cavalcade was, in consequence, a long one, headed by four pack-ponies carrying a couple of tents, food, blankets, and the minimum of personal impedimenta, and driven by a “packer,” mounted on a splendid black cayuse, whose duty it was to look after the horses and to “make camp.” A few yards behind him the travellers ambled lazily along on their comfortable Mexican saddles, allowing the ponies to set the leisurely pace, for the trail, which ran steeply up and down hill, cross­ing numerous gullies and streams, occasionally rose to a great height in order to cross some projecting shoulder of the cliffs. My own outfit consisted of a flannel shirt, a short tweed skirt and knickerbockers, heavy nailed boots, puttees, and a soft broad-brimmed hat, while from the horn of my saddle hung a woollen sweater and a pair of good field-glasses. The men, too, wore strong, serviceable clothes, nailed boots, puttees, and soft felt hats. 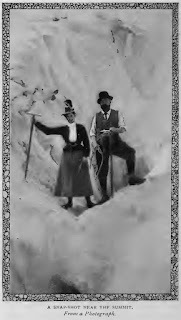 In the rucksack slung across the shoulders of one of the guides lay a folding Kodak, a compass, aneroid, and smoked glasses, while the other guide carried the ice-axes; the Manila rope being safely stowed away in one of the pack-saddles. So we jogged along the narrow stony trail, winding up through thickly-forested ravines and down the beds of brawling brooks, catching here and there, between the trees, exquisite vistas of the Valley of the Bow and the snow­capped range of the Ten Peaks beyond. Down the narrow trail cut out of the precipitous hillside we rode, where the crumbling path was scarcely a foot wide, and where to round each cliff one seemed fairly to launch out into space above the tree-tops of the valley below, until in half an hour the shore of the lake was reached, just in time to allow a catch of a dozen fine trout to be made before supper. 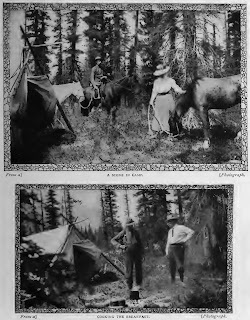 While the packer “hobbled” the horses, turned them out to graze, and made camp the guides reconnoitred the locality with a view to the ascent on the morrow, and presently the whole party turned in to sleep as one can only sleep pillowed on fragrant pine-boughs and sentinelled by the stars. “Four o’clock and a fine morning!” The cry of the guide awakened everyone to the importance of the day, and an hour later all of us had breakfasted, after first stowing away our belongings beyond the reach of thieving porcupines; then, leaving the packer to take care of the camp, we started out rich in the hope of conquest. 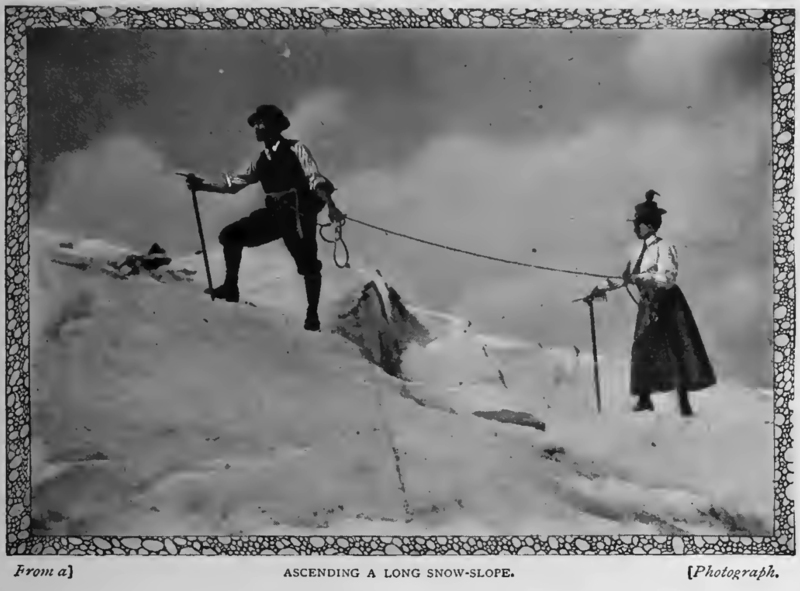 One guide put the lunch, Kodak, and field-glasses into his rücksack, the rope being coiled about the shoulders of the other man, so that we climbers “travelled light,” carrying only our ice-axes, and tying our sweaters by the sleeves around our waists. Clouds of crimsoned mist were drawn like curtains around the helmet-shaped snow summit of the peak which was our goal, for the sun lay somewhere behind the rim of the horizon and crowned the head of each mountain monarch with a shining nimbus. One guide led us; the other brought up the rear. No words can describe the patience, good humour, and skill of these Swiss; their quick eyes see every danger, their prompt actions avert it; when “on the rope ” one has a feeling of perfect security, and on steep arétes and rotten ice, on crumbling rocks and abrupt precipices, one has implicit confidence in their strength, judgment, and endurance. Bidden to jump, I have lightly crossed crevasses and rock-rifts, aided by a firm hand or a steady pull on the rope, which, had I been alone, I should have shrunk from in terror and dismay. With sobbing breath and set muscles I have scaled perpendicular cliffs, roped to and encouraged by a guide, which, in his absence, I would have deemed as difficult to conquer as all the tasks of Hercules combined. That these guides possess a sixth sense is indisputable; one might almost call it “acute premonition,” for it warns them in advance of all dangers incident to mountaineering, and, combined with a marvellous dexterity and an intrepid courage, serves to avert calamity and ensure success. Through the woods we wended our way upward, hope high in our hearts and the smell of the pines in our nostrils. Soon the route lay across a scree slope, where stonecrops grew, and a wonderful vision of blue gentians met the gaze. Then, suddenly, a golden ball shot up from the horizon, and the world awakened in the smile of the sun. The earth began to pulse with light and life. Marmots whistled shrilly from behind the boulders, a pica ran across the trail and, with a melancholy squeak, disappeared in terror beneath some stones; a few butterflies flitted past, and the Lyall’s larches shook their feathery branches in the strengthening breeze to tell that “tree line” was reached — the spot where green gives place to grey and the bounds of foliage are set. Here we paused to rest for a few moments and to take some observations and photographs before attacking the steep rock-work which lay ahead of us, and which was likely to prove a nasty climb, while sliding stones and insecure boulders might render the task both difficult and dangerous. At times a single step would send a shower of scree hurling down into the valley, or dislodge some huge rock which crashed away with terrific force and noise, only to be lost in the desolate gorge below. Extreme caution on the part of the guides, who tested and tried each foothold in advance, saved us from all accident, however, and after several hours of ceaseless effort we stood on the pass between two mountains, at a considerable height, and paused to gaze westward, where a grand view of Hungabee, Biddle, Victoria, Lefroy, Temple, and the Ten Peaks lay stretched out, gilded by the level rays of the sun. The haggard outlines of the hills, crisp-etched against the blue, looked cruel in the morning light, but where the fir trees fringed the warm, wet valley flowers and shrubs grew in abundance, their sweet odours floating up to the cliffs above. Here we “roped up,” and for the next thousand feet picked our way up steep ravines, across shale banks, and among great grey rocks —a wild and desolate climb. It was now that the gallant fibre of the guides bore with perfect equanimity and patience the strain of our stumbling steps, our occasional timidity, and our sudden jerks on the rope, as if their nerves were woven of steel. If I faltered, a steady encouraging pull, a cheery “Houp,there!” poured the red wine of courage into my veins; did the man slip, the rope held taut gave him certainty of safety, so that fear and fancies were left far behind, and success came ever nearer step by step. The edge of eternal snow! What a thrill it gives one to stand on the Rubicon and watch the bulwarks of the stone bastions hemming back a mighty rolling sea of ice and snow! There Nature’s last outposts sentinel the great white land, a place of awful purity, a clear, cold, calm country. Only about seven hundred feet now lay between us and the summit. A long snow-field, agleam on the eastern face, sloped up to the top of the mountain and by cutting steps here and there in the steeper angles the ascent was at length accomplished with comparative ease, and we stood conquerors on the summit. What a panorama greeted our eyes! We beheld crest upon crest sparkling under an azure tent, range upon range of grand and glorious peaks, snowy domes and frosted valleys, and Alpine streams weaving silver webs from the crystal outpourings of a hundred glaciers. To the north stood the giants Columbia (14,000ft. ), Bryce (13,500ft. ), Forbes (14,000ft. ), and Saskatchewan (12,500ft. ); to the south, Assiniboine (11,830ft. ); to the east, Cascade and the Banff district; and to the west, the Lake Louise, Field, and the Yoho Valley districts, the whole forming a sea of mountains unsurpassed anywhere else in the world, a scene of matchless beauty. On the actual summit where we stood, some slanting rocks, coated with dangerous verglas, protruded in places freshly powdered with light, loose snow. Others were completely windswept, while all around was flung a thick, frozen mantle fringed with glaciers great and small. The wind blew keenly and bit to the bone, so we hastened to build the traditional “stone man ” and to plant a tiny Union Jack (brought for the purpose) on its crown; then, after securing some photographs and recording a few important observations, we started downwards to seek a warmer temperature and shelter for lunch. A magnificent glissade brought us to the beginning of the rocks, where we soon found a nook screened from the wind and, ensconcing ourselves behind a big boulder, began to eagerly devour sandwiches and chocolate, washed down with whisky and water. Never did bread, butter, and beef taste so good, and never was John Barleycorn a truer friend than on this occasion, for the long climb in the crisp Alpine air had whetted our appetites to a keen edge. After lunch some more photographs were taken, and then the descent began in real earnest. A long scramble over the rocks was followed by another short glissade. Then came a bad bit of precipice where the guides were forced to lower us one at a time from ledge to ledge, and afterwards a long plunge down the shelving shale banks. Next came a halt in the flower-strewn meadows, and, finally, a tramp along the forest trail beneath the sweet-scented pines brought the tents into view.